In this final part, Charley talks about how he and his wife, Barby, came to live in Sisters, OR and his ongoing work as a horseman who is ever learning yet also seeking to impart what he has learned to others. But I didn’t listen to him. Then, the next morning, Barby went through the corral where I had put that horse. Walking in the house, she immediately cautioned me, ‘Charley, there is something not right with that horse.’ Being my arrogant self, I gave her the same line I had given Bill the night before. But I didn’t listen, even to myself. I kept on trying to work with that horse. Now, I had been given three opportunities. Bill. Barby. My own conscience. The Lord was speaking to me through each one. The accident happened around 1:00 p.m. I hollered for help but no one heard me because everyone was asleep, taking Sunday naps. Fortunately, for Montana, it wasn’t particularly cold, only about 45 degrees. So as I waited for help to come, I just praised the Lord and thanked Him. As wild as it might sound, I wasn’t in shock or in any pain. Honestly, I felt like I could have laid there forever. All I can say is that somehow Lord had encapsulated me. Four hours later, about 5:00 p.m., Barby started wondering where I was. Coming out to the corral, she found me and soon the ambulance arrived from Jordan, some twenty miles away. Loading me up, they ruined a $450 pair of boots and pair of chinks. Now that hurt. Soon Charley was flown by helicopter to a hospital in Billings where he underwent three operations during the sixteen days of hospitalization. Through that accident, the Lord stopped me in my tracks. The Word says that God opposes the proud. When that horse broke my leg, it dealt a blow to my pride, one that really allowed me to learn something about myself. As I lay in that hospital, unable to even wipe my own hind end, yeah, I started thinking about a lot about the deeper things — about me as a person and my relationship with the Lord. Major, major turnaround in me. I have often thought about that little stud and how I would work with him today. I know it wouldn’t take me but thirty minutes to have him follow my hand. 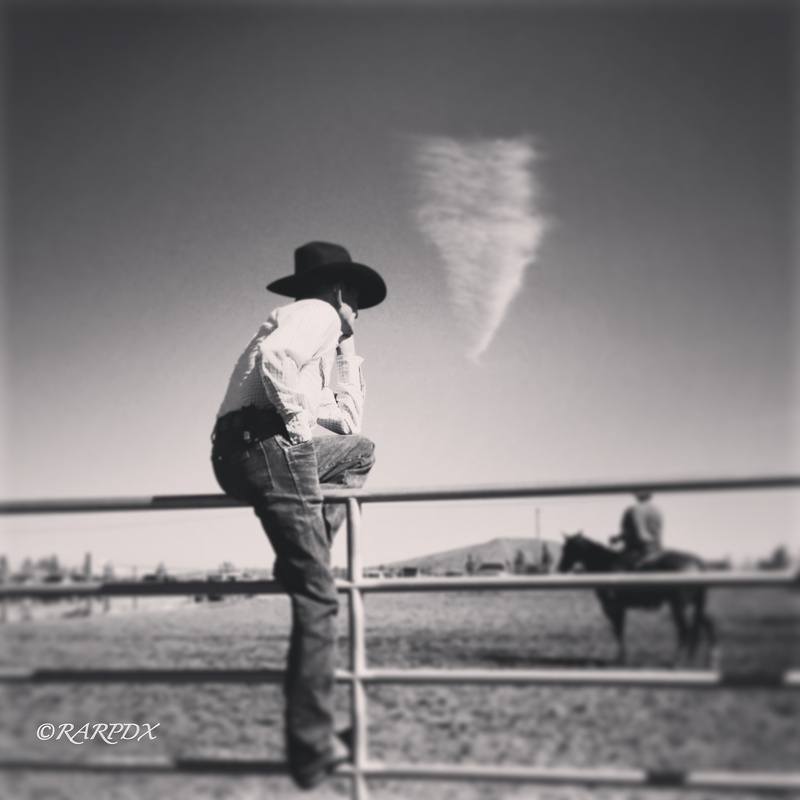 After Charley’s recovery, he and Barby left his dad’s ranch and, for the next twenty plus years, worked ranches, the first one in Oakdale, CA. In Oakdale, I was always on horseback doctoring, irrigating, or helping move cattle up to Yosemite but other than handling a horse or two for folks, I didn’t want much to do with horses as far as helping other people with theirs. Then some very kind friends, Tom and Francie Butler, folks as good as they come, brought me a three-year old horse. ‘Will you ride him for me,’ Tom asked. Coming out of being so badly hurt, truth was that I had developed a lot of fear. The day I went to get on that three-year old, I sat down in the corral and cried like a baby. Again, it was the Lord Jesus, working with me. Finally, I got the courage to get on that horse and, you know, I rode him for a year. When the ranch in Oakdale got sold, Charley and Barby found themselves in Oregon managing another cattle ranch. For years, I had wondered about the John Day River country and got the idea about moving there from time to time. So when the offer came to run the ranch in that area, we both knew that we would be going. During the twenty years we spent o that ranch, I didn’t have any designs on doing great things with horses. I did the work I needed to do and enjoyed it. Once in a while I would help somebody out a little with a horse, even some that could buck a little. Still I was able to get some pretty good things going even with those horses because Ray’s way of working with horses had taken hold of my life. His way was such a good way for the horse that you couldn’t turn your back on it. At least I couldn’t. I was always trying to get better and better at it. In 2010, Charley got an email from a lady living in Western Oregon. She was at her wits end with a horse she owned. It wasn’t long before the Snells were having lunch with Gary and Traci Carson. After Gary and Traci explain the situation they were having with their horse, I said, ‘Let’s go look at him.’ One look at that horse and I could tell right away that he was about to start hurting people. Even though the Carsons had spent a considerable investment on trainers, the horse had only gotten worse. However, I had seen his behavior before with other extremely troubled horses; it was nothing new to me. Again, I refer to the influence of Ray on my life. His way was a lot deeper than some method because Ray always considered how that horse felt. For example, if a horse is standing in a herd with his buddies and you see him exhibiting distress when you take him out of that situation, then you find ways to relieve that stress. By doing so, you are telling the horse that it is okay for him to be in your herd, that he doesn’t have to be in flight mode. When you do that, the horse will soon learn that he can depend upon you, the human being, for his safety, protection and provision. In this regard, a horse can look or move pretty good but you have to ask yourself, ‘Does he feel good? Does he feel comfortable? Is he at peace?’ That is the deeper thing that you look for. When I see a horse being troubled, the first thing I do is relieve the pressure. I do this by letting him know that it is okay to move his feet. Then I try to direct the movement of those feet in a meaningful way, not just going around and around in a circle, but I always change things up, go part-way, turn, slow down or speed up, so that the act of moving his feet turns into a little job for him. By doing it this way, the horse starts to think, not just react. Through years of experience, I have worked with a wide spectrum of horses — touchy, afraid, dull and lethargic. A really touchy colt might need to learn respect but, along the way, might needs a lot of reassurance. A dull horse might need to learn respect before he gets any reassurance. Unfortunately, so much horsemanship teaches you to do the same thing with every horse which is why wrecks can often occur. ‘A little thing,’ I had said. Well, unbeknownst to me, Traci sent postcards about the upcoming clinic all around the country. Also, unbeknownst to me the Lord was putting the wheels in motion for another soon to arrive life changer. The ranch we had managed for 20 years would sell the cows, lease the place and we would be dismissed. ‘No. We have never met,’ I answered confidently. Sure enough. Allison had one of Traci’s postcards and so we got talking. I told her that I would like to take a look at her trailer and she asked if I could help her with one of her horses. It wasn’t long, between Traci and Allison, before I was doing clinics in central Oregon and troubleshooting horses. During one clinic in Sisters, one of the spectators got a mounting block and put it down in the middle of the circle where I had gathered the riders. I actually thought it rather rude of her but did not say anything. Wanting to hear what I was saying, she sat down and started asking a lot of questions. Sure enough, it wasn’t too long before we became good friends and I was helping her with her horses and she began sponsoring my clinics near Bend. Again, I never start to work with a horse with the attitude that I know how it is going to work out. I just never do. Usually I am pretty sure where I can go but I always have some reserve and respect for what I don’t know about the horse yet, even some concern. It’s a funny thing, probably stemming from the fact that I know things can go to hell very fast. 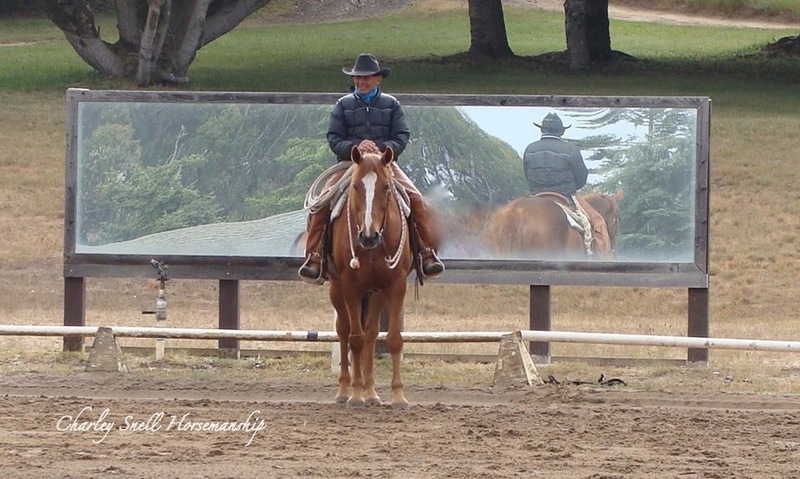 This way of working with a horse is so unconventional because it is not a method or formula. You don’t do this, then that. You work with a horse where it is at. Often you don’t even address some surface problem, such as a horse striking. ‘We have to deal with that,’ most people will insist. Forget it. Again, you work with what the horse is presenting to you and go from there. A horse that is striking might simply be acting with defensive response due to a multitude of other things. Again, when I am working with any horse, I want that horse to get right mentally and feel good about being around me. Otherwise you can make him more resistant. Sure. We do want him to show respect and not strike but he has to feel good around us in order for that behavior to change. A horse has to be turned loose of his ideas to accept ours. This happens through creating an environment where he feels at peace when he is with you. People often tell me their horse’s problem or try to explain in detail how they think it got traumatized, believing that these things actually mean something. Truth be told, they don’t mean anything. Why? Because, again, you start at the place the horse is at — and then go to where you know he can go. You don’t need to psychoanalyze a horse. In fact, I don’t really care what has happened to the horse before I work with him. What I am after is to get the horse to trust me. Then I take him to the place where he has full confidence in me, no matter what. Along this line, some people believe that horses always retain the memory of bad experiences. I don’t completely agree with this perspective for the simple reason that, when given a chance, a horse will seek out a good place. Sure. Horses have an incredible memory. However, when dealt with properly, the good will eventually outweigh the bad. If you offer a horse anything at all that allows him to find that place of peace, he will hunt it that up like a nice shady tree on a hot day. Unfortunately, a lot of people do not understand horses and, as a result, never offer their horses that good place. Some who have learned under the banner of ‘natural horsemanship’ have not yet learned to work with the nature of the horse. They come at this from a logical, analytical place of pressure and release, never thinking about a horse having the ability to make a decision or being able to choose. For example, if a horse doesn’t want to come into the center of a round pen, they put so much pressure on him, often having him go around and around and around, that the horse, out of resignation, not choice, comes into the center of the pen. They apply this to everything they do with a horse instead of finding the little ways that allows a horse to become engaged with the person. Developing this skill is something that takes a lifetime. If you saw me work with horses ten years ago compared to how I work with them today, I hope you would see an improvement in how I do things. Living in Sisters, OR, Charley continues to do small group clinics, private instruction and, in addition, works with troubled horses and consulting. I get a lot of satisfaction working with very troubled horses because I know how good a horse can become. Sure. I get a lot of nice compliments, emails and such and thankfully, because of that broken leg, those hours laying on the ground and being in the hospital, my ego is not inflated to the bursting point. It doesn’t bother me if people like or don’t like what I do. Because of the way that I grew up, isolated and rejected, I don’t think it is right for anyone to have that kind of pain. Hopefully, some of what I have gone through during my life and, how I have come through it, will help others experience peace in their lives too. I know how good it feels for the horse when he finds that good place. I know how good it feels for the person. Truth be told, if I did a hundred clinics that resulted in only one person realizing that it is not about getting the horse to do what they wanted but, more importantly, the person becoming who they were created to be as a human being, then those hundred clinics would have been worth the effort. Ultimately, that is my motivation. I often tell people, if I were a man of means, I would do what I do for nothing. I really enjoyed reading your story, thanks for sharing and I hope you will share many more of your experiences with us. Your journey is a wonderful tribute to what you have become. May God bless you now and always! Truly enjoyed reading your story and really looking forward to learning more about how to connect with my horses. Hi Charley,it may not exactly look like it but I get it. Press on, as you are making a difference in some lucky horses lives.